Pat Flaherty’s Studio has served the Boise Valley with professional affordable drum and percussion lessons since 1980. History – Many people remember driving down Five Mile Road in Boise, Idaho and seeing my sign for Drum and Percussion Lessons where I taught students in a small studio from 1983 to 2010. In 2010 I built my new studio and moved all my instruments, library, shop and students to my current location. My new studio is one of the largest and best equipped in the United States. I am now teaching the third generation of my past students. Easy Access and Comfortable – The studio is within a reasonable driving distance of most anywhere in the Boise/Meridian/Eagle/Kuna Valley. Parking is available. There is a waiting area in the studio for parents and other family members. Students Becoming Great Players – Most students at my studio exceed the ability of their percussion section and are frequently the Section Leader in the group. Many past have achieved prestigious positions throughout Idaho, the Northwest and the United States. Many are now professionals throughout the United States. Equipment – My studio is setup well with professional drum and percussion equipment. 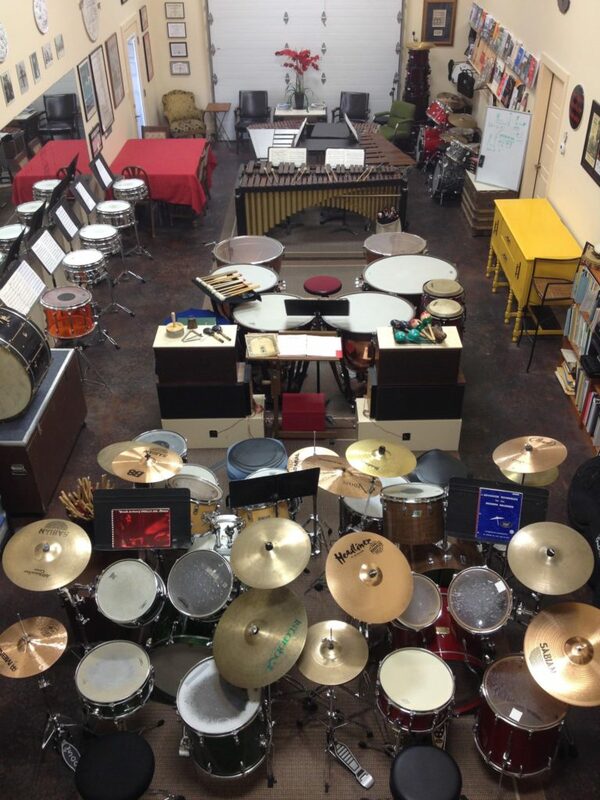 Play on some of best snare drums, drum sets, cymbals, marimbas, vibraphones, bells, etc. Many are prized vintage instruments. Learn to make a great sound by playing on great equipment as well as learning the characteristics of great equipment. Curriculum – After each student starts their lessons an individual training plan is developed including the Basic Patterns, Rudiments, Scales, Ear Training Skills, and Reading to help them realize their goals and dreams of playing drums and percussion. From there the sky is the limit. Sound Control – The instruments in the studio are outfitted with “low volume” drum pads, cymbals, mutes, etc. This increases the training time in each lesson and protects students hearing. Listening Library – The Studio is equipped with a thorough listening library, mostly vinyl, that introduces and reinforces how students take their raw techniques and develop them into sounds like famous players created to become the history of music recordings. Best Training Materials – After students start with my book “Adventures in Drums and Percussion” they progress to the most used traditional books in the industry. Each book will help them to develop and refine their skills on the five families of drums and percussion instruments; Snare Drum, Mallet Percussion, Drum Set, Timpani and Multi-Percussion. This training material foundation helps them build their library that will help them enjoy success in their learning and throughout their career. Percussion Ensemble Experience – As students develop their individual drum and percussion skills they will be provided an opportunity to join a small ensemble (2-4 and By Ability) and learn the advanced skills of creating music in a small group. Professional Network – As students progress and more opportunities are needed there is a long list of contacts for performing groups, camps, workshops, teachers in other areas, and educational institutions available. "I appreciate Pat’s thoroughness in teaching my son, Peter. Pat isn’t just showing him how to play a rock beat on a drum set, but is teaching him various techniques, musical styles, and instrument, making Peter a well-rounded percussionist and opening up many more doors for him." "Jared has really loved taking drum lessons from Pat. Pat is great with his students, both encouraging and holding his pupils accountable. The lessons have been a great experience for Jared as he grows with his music. Thank you Pat! " "In 4 years I went from having a casual interest in playing drum kit to being versed in Rock, Funk, R & B, Jazz, and World Drumming, as well as starting to become proficient in concert percussion, rudimental snare, and marimba (including four mallet playing). Pat's guidance has been invaluable." "Having taken about six years of drum & percussion lessons with Pat, I've grown as an aspiring musician aiming for the professional level. Every week I go I leave with renewed vigor to further my studies. Being well rounded, Pat has encouraged me enough to pursue all types of percussion, leaving no realm of percussion in the dark." "I first met Pat at high school drum camp in 10th grade. I had played in middle school and my freshman year but wouldn't call myself a percussionist at that time. I was just coasting along with everyone else and discovered I really didn't know how to read music! I started taking regular lessons with Pat and he helped me with drum corps leadership and people skills as well as becoming a well rounded percussionist. I went on to be corps leader, play in All-State band, and took 1st place at state in both rudimental snare drum and timpani solos my senior year. I highly recommend Pat to students of all ages. "I am getting better, especially since I have been taking drum lessons here. The experience is fun and easy. I am becoming a VERY GOOD DRUMMER! 😉 😉 😉 😉 "
You can find our students in most fine performing groups around the Boise Valley. Look for them in the Boise Philharmonic Youth Orchestra (BPYO), High School Bands, Combos throughout the valley, District, State and Northwest Solo and Ensemble Festivals, and even leading National Percussion Camps and Festivals like the Tanglewood Festival, Julliard Percussion Camp, Portland Percussion Camp, Alan Keown Percussion Camp, NTSU Percussion Camps (Texas) and many more…..